We found the following food map of Indian food posted on a wall in a dimly lit hostel in Varanasi. It is brilliant as it shows the regional variation of Indian food. India’s food really is diverse depending on the region and this map demonstrates the numerous influences that have combined to produce all the local speciality and staple dishes that can be experienced. Indian food is renowned as exotic and intense with a range of unusual flavours through the incredible array of spices that are used. We tried all the local dishes we came across and firmly believe that food is rooted as well as an expression of culture. A common voice that everyone shares and can share to bring people together. The best times we had was sitting around a table with people eating Indian food on the side of the street or bustling restaurant. It is therefore such a shame to see people eating western food that has been attempted by the locals to provide tourists with the familiarity of home. Travelling should be about taking on culture, trying new things and experiences. Food plays a fundamental part of this. So when you head to India, do not be shy or scared. Get involved and give it a go! Map of Indian food. Explore your taste buds! 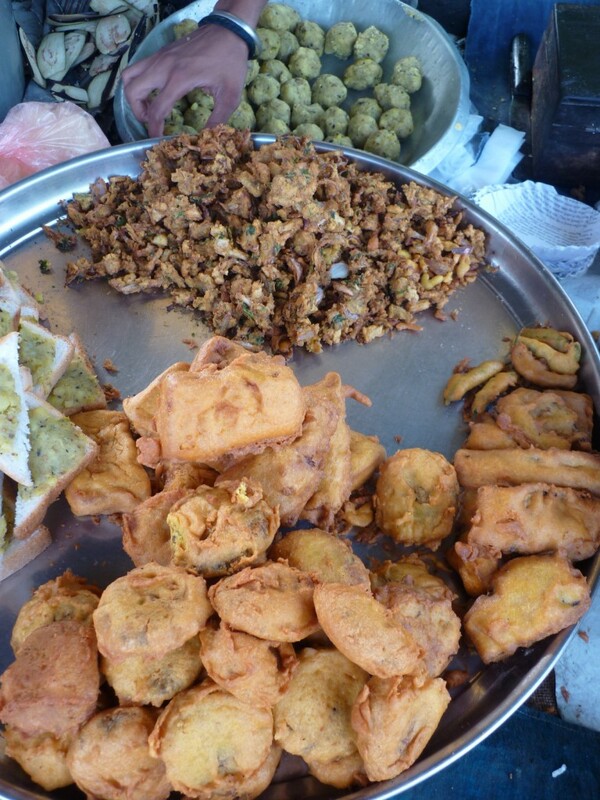 India’s incredible food is extremely diverse and has a wide range of influences. It really is a taste of the exotic. Many people we talk to are petrified by the thought of food poisoning and then end up staying away from any kind of local food, trying anything new and hoping McDonalds is in every town they visit. Stop. You are travelling to try new experiences and food is at the heart of travel and other countries culture. To miss it is a crime. There are a few things that you just need to bear in mind when buying Indian food and tips that will help you avoid buying food that has a high risk of carrying bacteria. That said, eating small amounts of bacteria is a good thing and helps you to develop the resistance needed to fight bad bugs in the future. Remember that western food in non-western cultures is alien. Locals know how to cook their own food the best, so that burger or pizza is likely to be more dodgy than the local cuisine (and more expensive). A restaurant is not necessarily a better bet than the street stalls. What goes on behind closed doors can be hidden. Street Food: Safe or not? We love eating Indian food on the street. It is where the locals and workers eat and there is such an incredible variety to try that varies between each state. Follow 5 simple rules to minimise your risk while at the same time increasing your experience. 2. Understand what time people tend to eat breakfast lunch and dinner to ensure you buy things as they are freshly cooked. 3. Look at what is being prepared and choose what looks freshest. 4. Avoid raw food and something that is boiling in a pot or steaming. Often it is not the food that causes the bug, but how it is handled or what is used to eat it off and with! Easy! Despite all this we did pick up a few bugs, but that is normal for a long trip. Just ensure you pack Immodium or other diarrhoea tablets, drink loads of water and eat dried biscuits as much as possible for a speedy recovery. Picking up a bug when travelling is almost inevitable at some point. A slip in awareness or being a little unlucky can mean a day or so in bed. Your body does get used to it though and it is very rarely that people are taken to hospital for a food related illness. That said there have been times when we have been referred to a hospital when we have not needed one. In Pune we were also told by our host that people in hospitals are also corrupt and will sell drugs and treatment at a massively over inflated price. In a moment of weakness do not get sucked into ploys to take your cash, but try and make logical decisions about your health. Indian food is fantastic. Enjoy its variety and unique flavour that will always taste better in India than anywhere else! Do you have thoughts on food hygiene or tips on how to avoid getting sick? Let us know below!